UPDATE [5/25] Read FULL interview here! 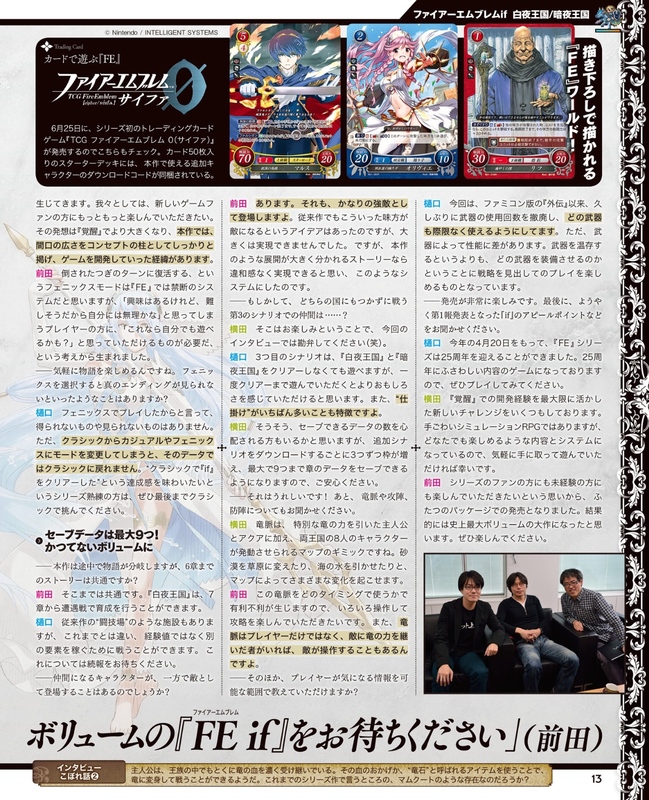 Today’s Famitsu had an interview with three developers behind Fire Emblem: IF. Here it is translated below. I have not put it on the page yet, so all in text. The original Famitsu pages are provided. 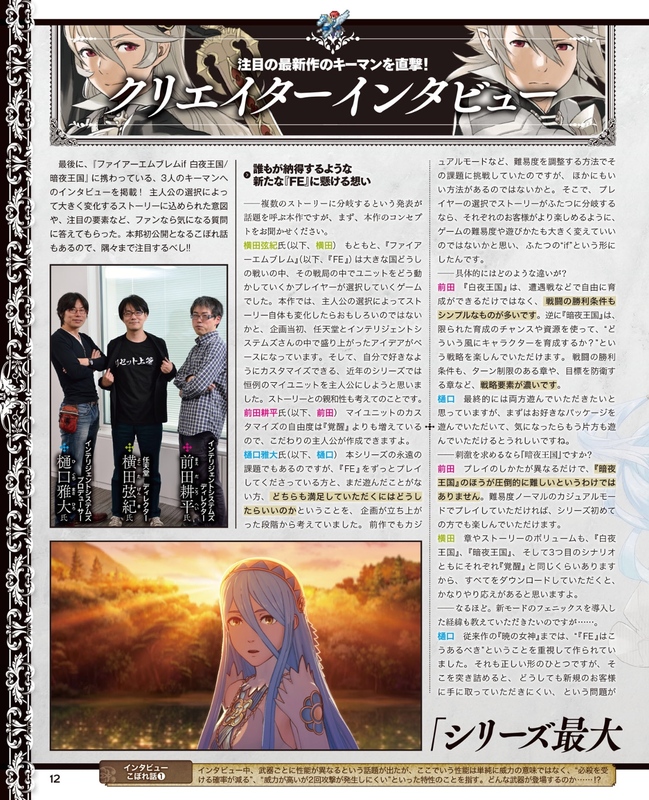 Lastly, an interview with three key figures behind “Fire Emblem: Hoshido and Nohr” has been published! The game is designed around the main character’s choices changing the overall story. Fans have noticed various things since the game’s announcement, and so this interview aims to answer some of those questions –even the nit-pickiest things! >Who came up with the idea for the new “FE”? –This game features diverging paths and multiple storylines, and so on that topic, please explain the concept behind the game. Yokota Kenki (From now on, Yokota):”Fire Emblem: Hoshido and Nohr” (from now on referred to as FE) was always a game about the player having to maneuver their units in the midst of two massive countries locked in a mutual struggle. For this game, the main story changing as the result of the main character’s choices alone was an interesting idea that Nintendo and Intelligent Systems got excited about during the planning stages. Also, the ability to customize a character as one likes has become a staple of the series, and so we thought to make “MyUnit” the main character this time. They have an affinity with the characters of the story. Maeda Kouhe (From now on, Maeda): The customization of “MyUnit” has been improved since “Awakening,” and so one can edit down to even more specific looks. Masahiro Higuchi (From now on, Higuchi): A fundamental question about the FE series has always trying to satisfy existing fans and those who have yet to play it. We took steps during the planning stages while considering this. In the previous game, things like “Casual Mode” were there to help adjust the difficulty level as a way to tackle that problem, but there were not many other things that helped. The game has a split story with two paths the player can take based on their decision, as well as being able to look forward to a game where there are various difficulty modes and ways to play. With this in mind, it became two separate games. –What are the specific differences between the two? Maeda: In “Hoshido”, one can freely engage in battles and level up their units, and the victory conditions are very simple. On the other hand, “Nohr” has limited chances to gain experience and limited resources. The strategy revolves around “what is the best way to raise these units?” The victory conditions in battles vary, such as chapters with limited turns, or to attack/defend an objective, etc. It is much deeper tactically. Higuchi: While we want players to experience both sides in the end, they should start with the package that appeals more to them. But if they are considering what the other side is like as they play, it would make us very happy. 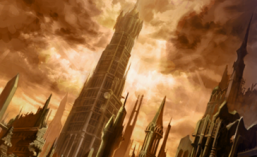 –What would be the motivation for choosing “Nohr”? Maeda: While players will go about it differently, the “Nohr” side is not necessarily overwhelmingly difficult. Players can pick Normal or casual modes, so first time players can still enjoy it too. Yokota: The volume of chapters and story in “Hoshido,” “Nohr,” and the third scenario are all the length of Awakening. All are downloadable too, so we aimed to give a considerable amount of content. –I see. Please explain the details of the newly announced Phoenix Mode. Higuchi: From the start until “Radiant Dawn,” we built up the view that those games are the “ideal FE style.” But with that sort of game, one new problem was born: we reached the logical conclusion that it was always difficult for newcomers to pick up. We wanted to make a game that new fans could enjoy too. We wanted to make it even bigger than “Awakening” with this concept as the focus first and foremost. That was the beginning of the game’s development. Maeda: A system like Phoenix Mode which lets fallen characters revive the very next turn I thought to be system ill-fitting of FE. However, it was deemed necessary for players who may think, “This is very interesting, but seems much too difficult for me. But with this mode, maybe even I can play it?” With these players in mind, this mode was born. –A way to casually view the story, hmm? Does choosing Phoenix mode cause any limitations such as being unable to view the best ending? Higuchi: Just because a player chooses Phoenix mode does not mean they will miss out on any scenes or items. However, if you change from Classic Mode to Casual or Phoenix Mode, that data will be unable to change back. For those proficient in the series who want the sense of accomplishment in completing “IF” on Classic, please play on Classic without changing all the way to the end. –The story splits into two paths along the way in this game. Is the story up until Chapter 6 the same then? Higuchi: There is a system sort of like the “Arena” in place, but different this time around. Rather than earning experience, you fight to earn a different sort of component. Please wait for follow up information on this in the future. –Do characters who become allies also appear as enemies on the other path? –Maeda: Yes. They appear as quite formidable enemies even. While we had done the idea of fighting a friend turned foe in the series before, it was not implemented on a grand scale. As this game was developed on a grand scale with branching storylines, we believe the system was implemented quite smoothly this time. –By the way… who are your allies on the 3rd Scenario where you side with neither kingdom? Yokota: That’s right. For those who worry over save data, please rest easy. 3 save files come with each downloaded additional episode for a total of 9 places for your chapter saves. –That’s great to hear! Next, please explain Dragon Pulse and whether it is offensive or defensive. Yokota: Dragon Pulse is a special power of Dragons that serves as a map gimmick. It is put to use by the Main Character and Aqua, as well as 8 different characters between the two kingdoms. It changes the map in various ways, such as transforming deserts to grassy plains, or drawing water from the sea. Maeda: Depending on the timing of Dragon Pulse, it can provide a serious advantage or disadvantage. We hope players implement this in their various strategies. Also, it is not just the player who uses the power of dragons, the enemy will have units who are able to utilize this too in their own strategies. –Aside from that, what other information can you give players regarding information on the game? Higuchi: In this game, we bring back a mechanic that had not been used since “Gaiden” on the Famicom –the weapons do not have any limit in uses, you can use them as many times as you would like. However, there are variations in ability/performance of each weapon. Rather than conserving weapons, the strategy will revolve around those weapons which are equipped. –I am really looking forward to it. Lastly, please explain one defining point of IF that is most appealing. Higuchi: April 20th of this year was the FE series’ 25th anniversary. The contents of the game are suitable for a 25th year celebration. Please give it a try! Yokota: We used all the experience in developing “Awakening” to the fullest to bring a great number of new challenges this time. While it is a difficult Simulation RPG, there are modes and content with a system anyone can enjoy. We hope you freely pick up and play the game. It would make us happy. Maeda: We offer two different packages both for fans of the series and newcomers to look forward to. In the end, this game is the largest we have made to date in terms of sheer volume. Please enjoy this epic game. This entry was posted in Fire Emblem, Interview, Magazine, Translation, Video Games and tagged 3ds, awakening, casual mode, classic, dragon pulse, english, famitsu, fe, fe14, fire emblem, gaiden, if, intelligent systems, interview, japanese, nintendo, normal mode, phoenix mode, raw, scan, translate, translated, weapon durability. Bookmark the permalink.